Photo provided by Mr B Gill. 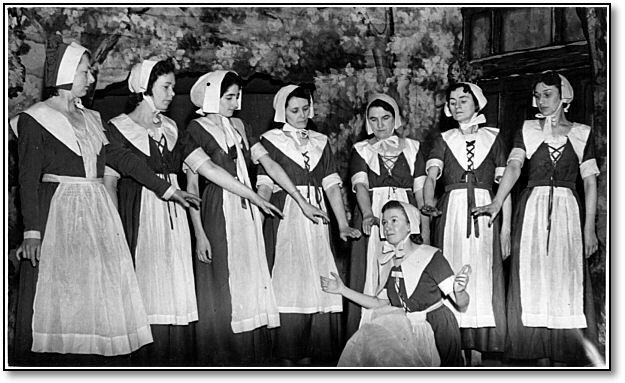 Picture shows the chorus line from the Sutton Amateur Dramatic Society's 1950 production of Quaker Girl. The date "Feb 20th 1950" is hand-written on the back of the photo. Does this bring back any memories for you? Alice Hanson (contralto), Rene Brooksbank (nee Robinson), Cynthia Schoon, Kathleen Riley, Florence Gill, Mary Ellison (nee Bottomley), Constance Riley, Betty Whitaker (nee Filkin) soloist (kneeling). The conductor was Mr Broughton.